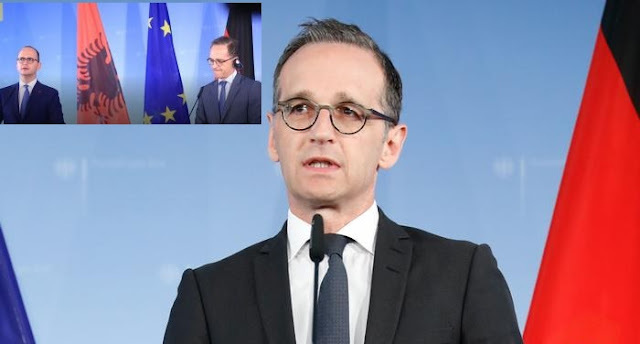 Minister for Europe and Foreign Affairs Ditmir Bushati is in Germany where he held a meeting with German Foreign Minister Haiko Maas. The ministers discussed the excellent relations between the two countries and the great contribution Germany has made to Albania and its prospect to EU integration. In this context, it was agreed that the agenda should continue at full intensity. Minister Bushati thanked Germany for its clear stance on EU's recent decision-making. "Our path is clear in terms of 2019 and we will work in maximum in the next 12 months bz working closely with the European Commission for the screening process," Bushati underlined. The Minister Maas underlined that Albania is an important partner and anchor of stability. Appreciating the reforms undertaken by Albania as an impressive and example for the region in terms of justice reform, he added that "It is crucial that this path continues", and called on political actors to support these important reforms for 2019 . Minister Maas expressed his conviction that the integration of Western Balkans into the European Union is in the interest of the latter in order to avoid the extent of the influence of third forces in the region. The two ministers also focused on the security and climate with wich the Western Balkans is facing and the role of Albania as a factor of peace and stability. For Bushati, the security climate in the region will get improved as long as the European perspective of the region is clear and concretized by concrete instruments and actions. Ministers Bushati and Maas talked also about the cooperation within the OSCE as well as for the Magistrates' School. Donald Trump of Albanian descent?